I saw this sweet book at the library today. It is a children’s book. The book has pictures of a thing, then it has the picture of its opposite. It has a picture of a furry Star Trek monster with the word furry under it. The next picture is that strange lizard from the worst fight scene ever. That one is a picture for scaly. Scaly is the opposite of furry I guess. I enjoy the pictures but my favorite part was “Explore strange new words,” written on the back. 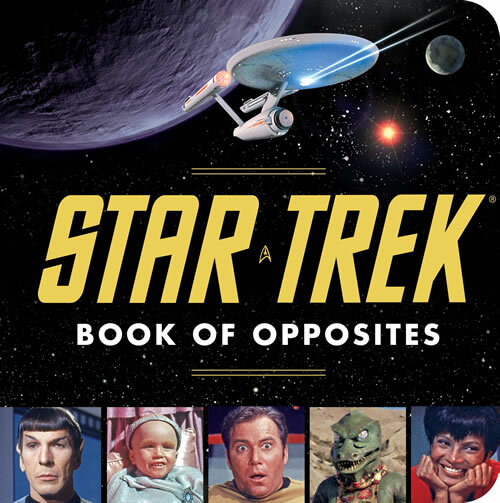 The book is for children, but hipsters that enjoy trek would find it excellent as well. This book can be purchased online here. Operation Speak Out With Your Geek Out is an initiative to raise awareness of who “geeks” really are, and to destroy some hurtful negative stereotypes, by getting people to talk about the things we enjoy and why we enjoy them, in the hopes that others may learn to appreciate them too. Mystery Science Theater 3000, which I will refer to as MST 3K, was a quirky sci-fi show from the nineteen-hundred and nineties. The premise of the show was evil scientists on earth sequestered their janitor, Joel, on a satellite and forced him to watch bad movies until he goes mad. Joel, the eternal optimist, used spare parts around the satellite to build some robot friends so he can have some company. 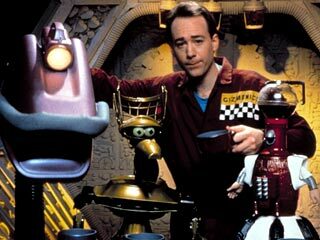 Crow and Tom Servo watch the movies with him. You can see all three of their silhouettes as they watch the movies and make hilarious comments. Gypsy is a car seat and vacuum hose and runs day to day operations of the satellite. Every episode begins with an invention exchange between Joel and the evil scientists. My favorite invention was a playing card, the eight of Chris Lemmon, son of the very talented Jack Lemmon. After the exchange the “movie sign” would light up. Joel and the robots would then watch a terrible movie like Gamera, Pod People or Beatniks. Beatniks was a movie so awful beatniks refused to be featured in it. My favorite part of the show was getting some snacks and watching with my brother and our friends Luke and Kevin. Usually we were making so many of our own comments we couldn’t hear what the robots were saying. We also made a habit of renting our own bad movies and giving them the MST 3K treatment. Those are my fondest memories of my high school days. It was a chance to forget about homework and my jerk classmates. Mostly though it was quality time with my geek brother. 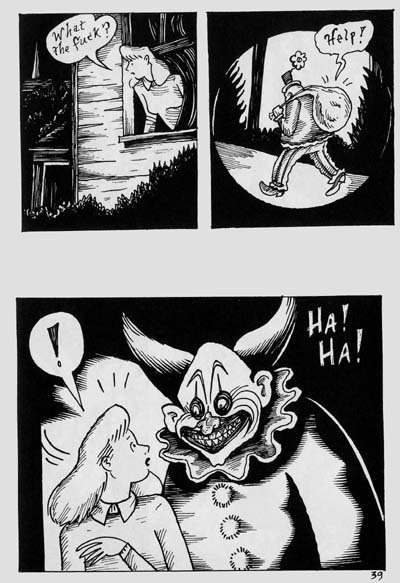 Richard Sala is an amazing comic artist. Many of you might remember his cartoon “Invisible Hands” on MTVs Liquid Television. It was a six part mini series that aired in two minute segments while you were waiting for Aeon Flux to come on. 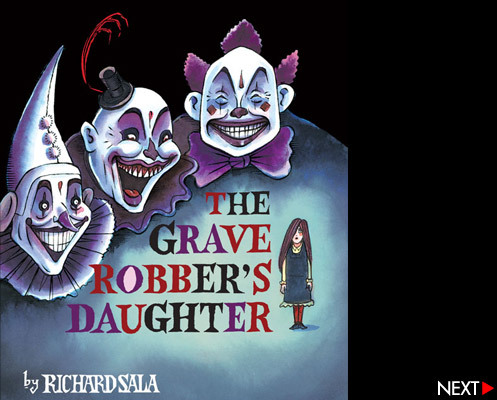 It is another one of Sala’s masterpieces that features a female detective who’s car breaks down near creepy town that is overrun with scary undead clowns. Below is my favorite clown picture of all time. 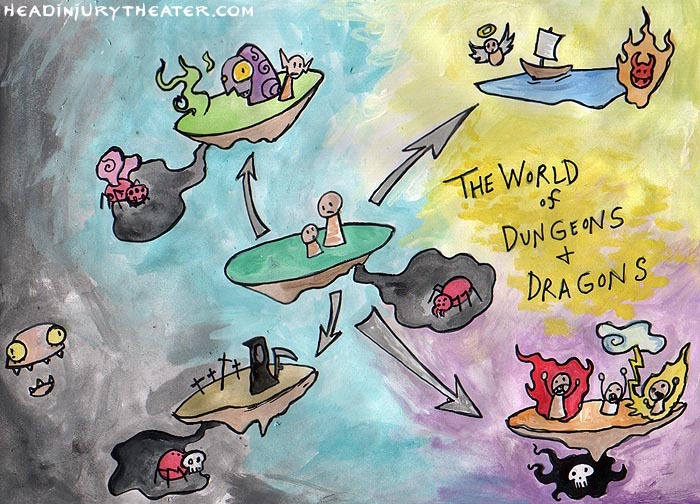 One day I was looking for a map that showed the different realms in Dungeons and Dragons and I came across this image. Look how fantastic that is! I immediately fell in love with the work and forgot what I was searching for but I saw the top left and that is when I fell in love with Head Injury Theater. I love how is art looks child like and at the same time you can tell he’s had some training. His career began quite by accident. He was at the Opera Don Giovanni and had trouble understanding the plot so he decided to make a drawing of the characters to help him figure it out. His opera singer wife scanned the photo and posted on her Opera Singer Forum and within 48 hours he was having offers to put it on T-Shirts and such. It snowballed from there and he now makes are for various board games and role playing games, including Dungeons and Dragons. 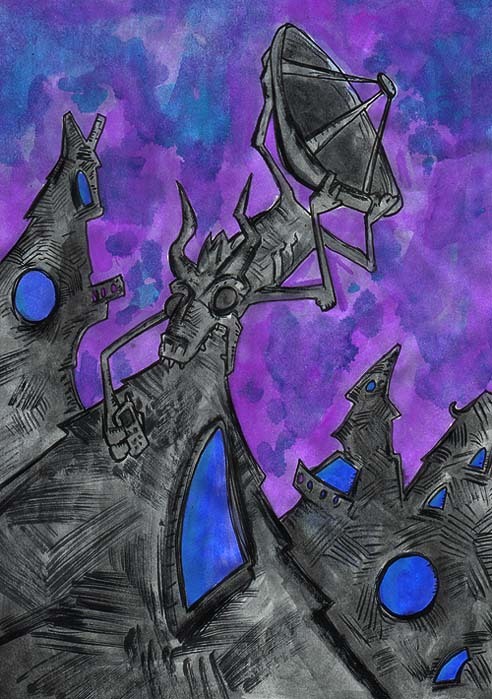 Here is a paining I made influenced by Jared’s style. I hope you enjoy his art as much as I do. 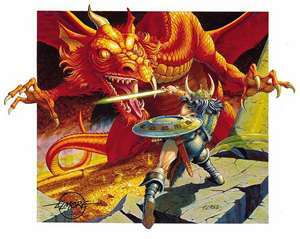 Wayne Reynolds is another artist that has worked with Dungeons and Dragons a lot. 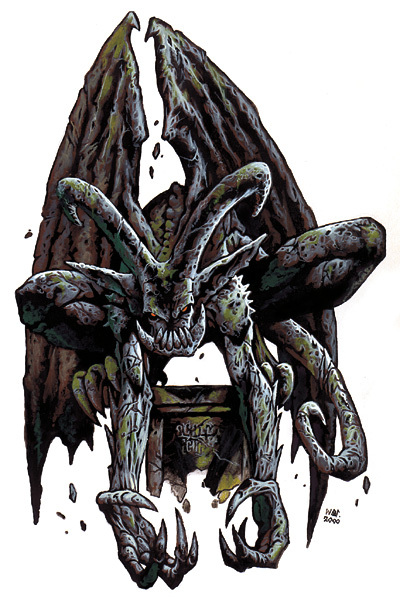 My first encounter with Wayne Reynolds art was when I was thumbing through the third edition Monster Manual and saw this gargoyle. Look how beautiful that is. I looked through the book and found that most of my favorite pictures were also his. He has a very strong style and all of his paintings ooze “cool”. See all the drama of being hunted by a creepy vampire. 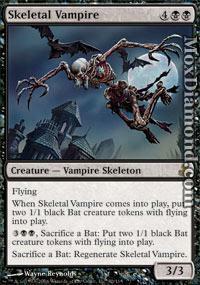 Wayne’s art has been featured in games like Dungeons and Dragons, Pathfinder, Magic: the Gathering and more. See more of Wayne’s art and read about the legend here. 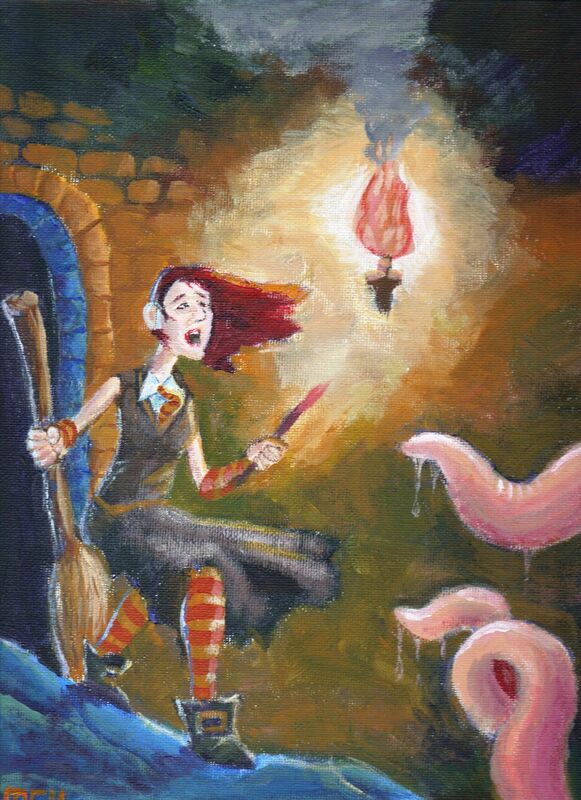 I have also used some his paintings for inspiration in my own work. I used the wizard from the cover of the 4th Edition Player’s Handbook(left) as a model for this Gryffindor hottie painting(right) I made for my friend. 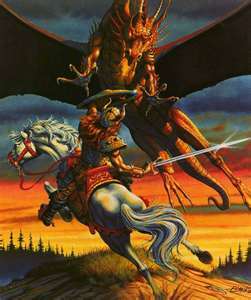 I would see a ton of Larry’s art over the years, mostly it was this guy fighting dragons. 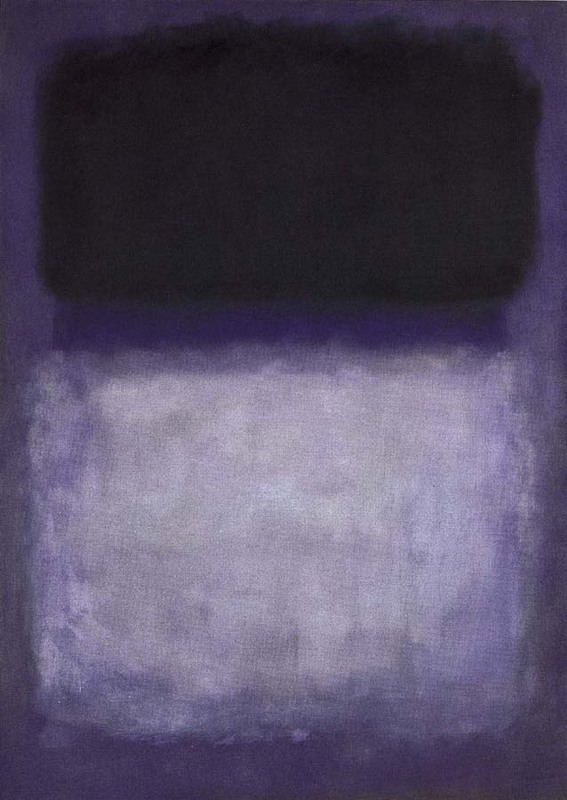 Did you see he was selling paintings for like $5000? Wowie Zowie I want some of that! I always thought that would be a fun job. Make money painting B.A. stuff like this. Going to conventions as a guest of honor. 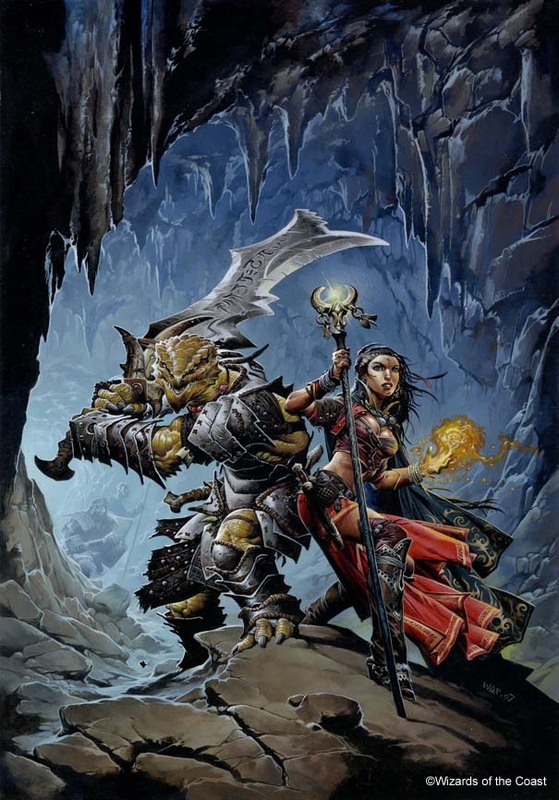 So this will be one of my goals to be accomplished within the next 5 years: Have some of my art published in a role playing game. DnD would be preferred but any RPG company will do. 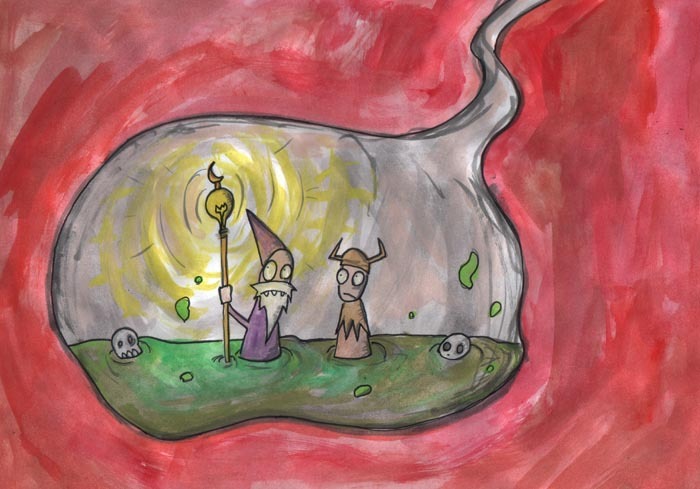 If the 5 year deadline is coming and my art has yet to be published in any RPG material I suppose I will just have to create my own adventure or something and use my own art.